Beautifully engraved certificate from the Comptometer Corporation issued in 1961. This historic document was printed by the American Banknote Company and has an ornate border around it with a vignette of an allegorical man and woman sitting in front of a factory on both sides of a comptometer adding machine. This item has the printed signatures of the company�s president and secretary and is over 45 years old. These certificates are very hard to find and quite desirable. In 1957 the Felt & Tarrant Mfg. Co. became the Comptometer Corporation and had manufacturing operations in the United States and England. 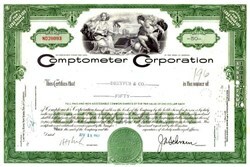 The English operation along with the rights to use the name Comptometer were sold in 1960 to Control Systems Limited, owner of the Bell Punch Company Ltd. and its distributor Sumlock Ltd. which became Sumlock Comptometer Ltd. The US manufacturing operations were stopped and Comptometers were manufactured in England by using a plastic-metal mechanism of inferior quality. In 1961, the Comptometer Corporation merged with Victor Adding Machine Company to form the Victor Comptometer Corporation. The new models introduced by Victor used the internal Bell-Punch mechanism. The Comptometer used a "multiple order keyboard" also called full keyboard which consisted of a matrix with 9 rows of keys, one for each digit (1 to 9). The number was entered by pressing one digit in each column. There were no Zero keys because zero was represented by the absence of a keystroke in the corresponding column. This arrangement of keys, initially introduced by Thomas Hill in 1857, became very popular during the first half of the 20th Century. In the Comptometer, pressing a key advanced a wheel mechanism to cause the positional value of that key to be added immediately to the displayed total. Therefore, for a given position in a number, the user could enter the non-zero digit or a combination of digits that would add-up to the digit, for example: 3 and 4 instead of 7. Users were also able to press keys simultaneously in several columns while entering a number. Notice that a full keyboard arrangement already contains the positional value information for a given digit, which no longer exist with modern 10-key arrangements where digits must be entered in sequential order. All these features allowed for faster data-entry tricks used by skilled Comptometer operators. Subtraction required the addition of the nine�s complement. A lever on the right side was used to clear the display. Comptometer operation became a formal profession and required a lot of training. A good Comptometer operator was able not only to perform additions and subtractions at fast speed, but also multiplications and divisions by applying repeated additions and complementary subtractions, respectively. The usage of the low value digits became so popular that some companies introduced half-keyboard versions of the Comptometer. Torpedo (1935), Plus (1935), and Contex (1950) are typical examples. These keyboards only had digits from 1 to 5. 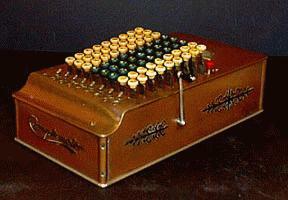 Comptometers weighed from 17 to 25 pounds and were priced between $300 and $400. Two years after he arrived in Chicago at the age of 20, Dorr Eugene Felt designed the first crude model of what was to become the Comptometer. It would take another 2 years to complete a design that would meet his standards for performance and reliability. Meanwhile. he had been working in various Chicago machine shops, eventually teaming with Robert Tarrant who was supportive of the work with both time and money. By 1887, they had formed the partnership of Felt & Tarrant which was later incorporated. By mid-1887, eight machines had been built and after a brief trial, four were installed in U. S. Treasury offices, a marketing coup of considerable importance. The other machines were quickly snapped up by Chicago area companies who very soon presented Felt with the problem of providing trained operators. So quite early in the life of this venerable machine, we can see the tight bond between high speed machine and trained operator that was to become the cornerstone of the company's success. About the same time that Felt first patented his Comptometer, Wm. S. Burroughs had devised a "adding-listing" machine which provided the seed for the company that would become an arch rival for Felt & Tarrant. Quickly, Felt and/or Tarrant decided that the addition of a listing feature to the Comptometer would be required. Thus began the search for a way to combine a printed listing with the speed of the key-driven Comptometer. The Comptograph "adder-lister" would occupy the design talents of Felt for the next 14 years and dispite some notable technical achievements, never quite reach the elusive goal. By 1902 Felt had had enuf but Tarrant still believed in the adder-lister and the two split the business with Felt retaining control of F&T and Tarrant taking command of the Comptograph Company. Felt would now concentrate his energies on improving his beloved "shoebox" machines and running the business as he saw fit. While the Comptograph had some initial success in Europe, it quickly died off with the start of WWI in 1914. Sales of Comptometers seem to explode after the arrival of the F-model in 1915. While the war certainly had an impact, the new model with its novel error- detection and correction "Controlled Key" feature was a more likely factor. In a bit less than five years, over 42,000 of this model were sold compared to half that number for all models combined for the previous 30 years! The company had clearly arrived on the U.S. business scene as its expanded manufacturing facilities attested. By 1920, F&T had a worldwide business requiring some 100 fulltime salesmen. For the launch of the new H-model, Felt would bring them to Chicago in June for a convention that many would likely consider the hilite of their career. (click above for detailed views) This amazing panorama is over 36" wide and (unlike the blended image above) was a single photograph! It clearly entailed considerable time and cost to set up and reproduce copies for all attendees. The "Roaring 20s" were destined to bring Dorr E. Felt and his "shoebox" Comptometer the success that both so clearly deserved. The J-model was introduced in early 1926 with several refinements but no new major design feature. But its pedigree was such that it became the backbone of the business and remained in production for some 50 years! After Felt's death in 1930, the company would introduce a varity of machines but none with the unique style and elegance of the "shoebox" models. By 1946, tax problems would force the 11 family descendant stockholders to "go public" (an IPO). In 1957, the name Felt & Tarrant disappeared and the company was listed on the New York Stock Exchange as The Comptometer Corporation. A few years later it would merge with the Victor Adding Machine Company and eventually disappeared. Much of the above information was obtined from the Com[tometer website at http://www2.cruzio.com/~vagabond/ComptHome.html#Intro.